Hotmail’s new throw away Email accounts-First real unique & useful feature in a decade! Hotmail was my first Email ID that I created about 14 years back. Back then, using email for communication itself was new and exciting. However, now email has become an integral part of one’s daily lives. Hotmail was really hot back then and anyone and everyone on the internet sported hotmail email ID. Scenario has changed drastically in the last decade. After Hotmail came Yahoo and then youngest of all Gmail. However, as it stands today, Gmail is THE best web mail clients – thanks to their innovation every step of the way. I hardly see anyone using Hotmail IDs now! Although, I still log-in to my hotmail account, it is probably once in a month or even lesser (and to gmail about 10 times a day!). One of the main reasons why Hotmail has been a laggard, even though being the first and biggest of them all, is purely due to lack of innovation and failure to understand changing customer needs. Last few years have seen only one trend – Google innovated and implemented, while others followed. That gave Gmail the edge and everyone wanted to be associated to them. 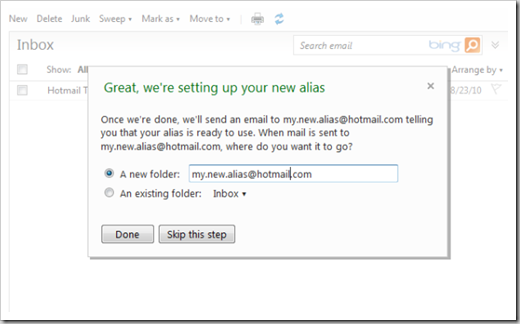 Throw- Away Email Accounts or Alias Email Accounts! It is surprising that neither Gmail nor Yahoo have got this feature as yet. Alias Email account essentially means that you can have single email ID, and create different aliases for that email. This makes creating a new email ID quick and easy. Suppose in your college days you have created and email ID [email protected], but you cant use the same when you start working or share the email ID with your relatives. So you’d have needed to create a completely new email account with additional hassle of checking both the email IDs. But with Hotmail’s Alias accounts, it becomes super easy. Just create an alias and share that. All your mails including Aliases, will fall in the same mail box. Each user can create up to five aliases, any of which can be deleted and replaced with another at any time. Over time, Microsoft will increase that limit to 15 aliases per account, making it so that the true heavy users won’t need to juggle between two or more Hotmail accounts. This is also a great feature for people who do not want to share their real email ID – Just give your alias email ID and your original will always remain safe and annonymous !! Kudos to Hotmail for being the first to launch this…what say guys ? Mobile Phone Radiations Health Risk – Government says Yes! Cricket World Cup is here – And so is ambush marketing!! Hacking Goes Mainstream in 2016: 7 Major Hacking Incidents That Rocked Online World! Why do we need an alias ? Gmail has this amazing feature.f you’re giving your address to a potentially shady website, tack on +spam to the end, example: [email protected]. You can then filter those emails into a spam folder you check periodically.You can create as many custom addresses as you wish by using the + sign and a keyword, and then filter them. Aha….VJ – you are actually absolutely right…did not think about it… Just add + or dot inside your username, and it actually becomes a new address… Good one..
Hotmail’s new is actually not so new after-all :) and like few said here…Yahoo also has this functionality…I did not know abt it coz, I dont use Yahoo.. But the Gmail feature is pretty much useless: if people really used that feature spammers would easily catch on to it and remove the +something from the e-mail address, and now they would have your true address. Hotmail and Yahoo are much better in this respect because they let you choose a completely different alias. I am sure they will… sooner than later. This is just too much ado about nothing. HOTMAIL you are not HOT anymore. Just go back to microsoft’s closet FROM where you just were brought out for the last week! Age old feature of Yahoo. Assuming that it is a brilliant innovation, what Hotmail needs is something that cannot be replicated. Google can probably incorporate this in a week and then we are back to square one. Its certainly a commendable thought from Hotmail. But, I would have rather preferred them allowing our older Alias E-mail ids albeit with different websites, that could be surfed on a single platform. For example, what if I already have 1 id in yahoo, another in gmail and one more in rediff? In this case, I need a single platform which can allow me to access my email ids without visiting different websites. Won’t POP mail do that? Prajwal is right. I have owned a alias for my primary yahoo a/c (see the email address), created via Yahoo Messenger, since last 5 years. Emails to this alias go to my primary yahoo a/c.